We’re celebrating Christmas in July here on DFB! 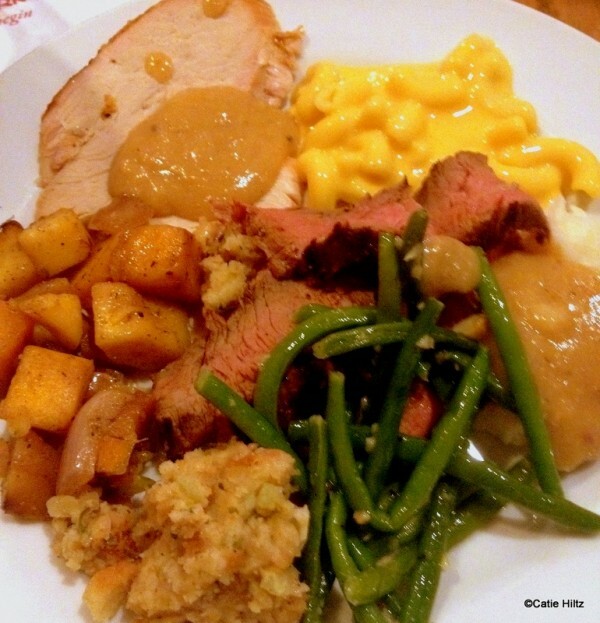 I know you’re all planning your holiday trips right now, so here’s a great suggestion for a holiday meal. Welcome back Catie Hiltz with a dinner review from the Magic Kingdom. 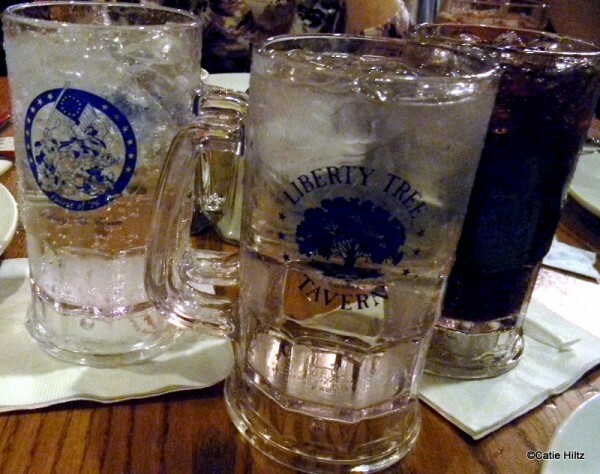 This time, we’re visiting the Liberty Tree Tavern at Walt Disney World. 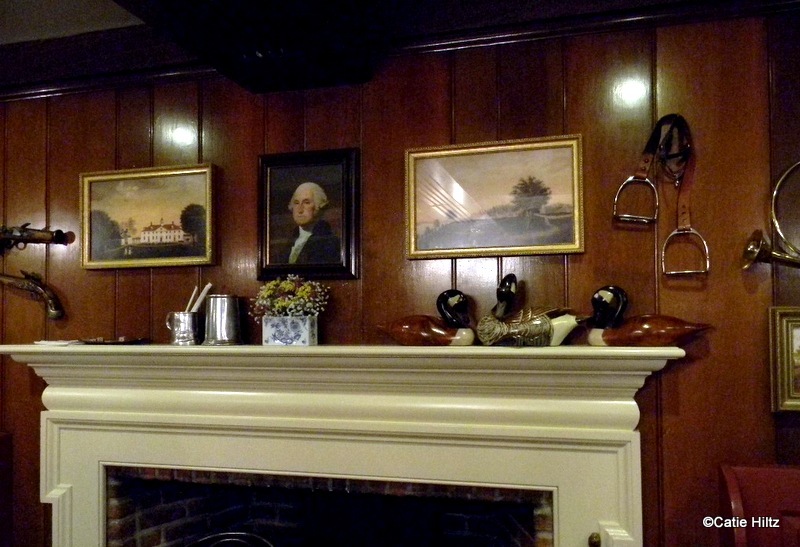 This colonial setting is one of our favorites! Back in the summer while we were planning our Christmas Walt Disney World trip, we were trying to come up with places to eat on Christmas Eve – and when Liberty Tree Tavern was suggested, I thought, of COURSE – that’s the perfect place to have dinner on Christmas Eve – not only would the menu of turkey and all the trimmings be perfect, but its location inside the Magic Kingdom is positively idyllic for celebrating the holiday! After spending the afternoon in a crowded Magic Kingdom, we were more than ready for our 5:45PM dinner Advance Dining Reservation on Christmas Eve. So we headed over to Liberty Square around 5:30 and gave our name to the hostess. Since we were early, we had some time to check the place out. There was a beautiful Christmas tree in the lobby. 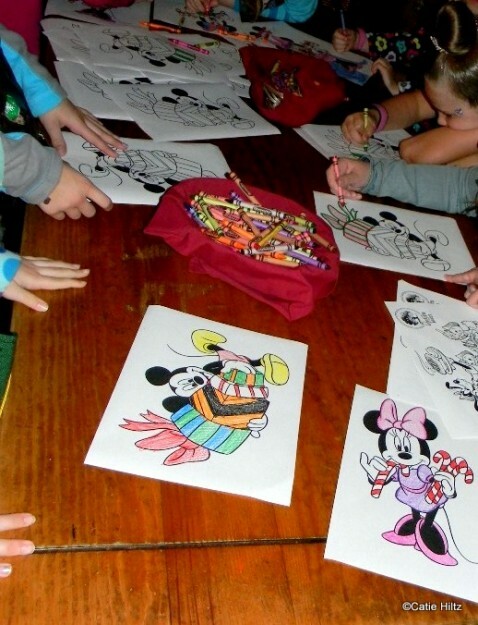 A coloring area was setup with cute Disney themed holiday coloring pages. 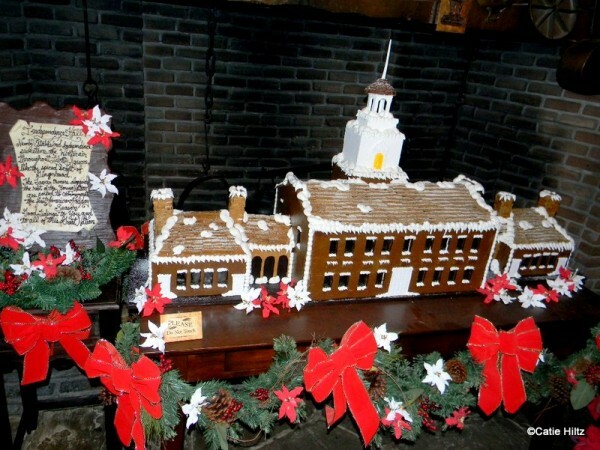 We admired the beautiful gingerbread display, and as usual – Disney didn’t skimp on the details, either. Everyone seemed to thoroughly enjoy checking it out, and several people (like me!) snapped photos too. 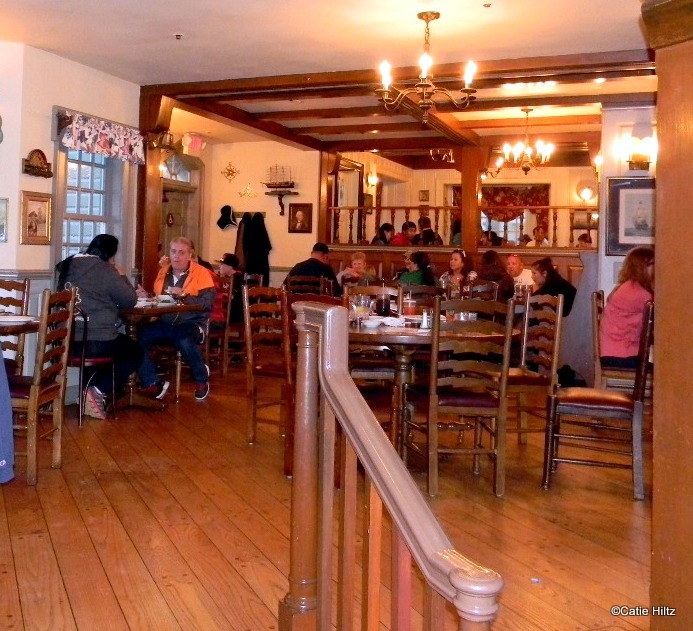 Liberty Tree Tavern is a colonial themed restaurant, so the décor is pretty rustic — lots of wood and interesting artifacts hanging on the walls. 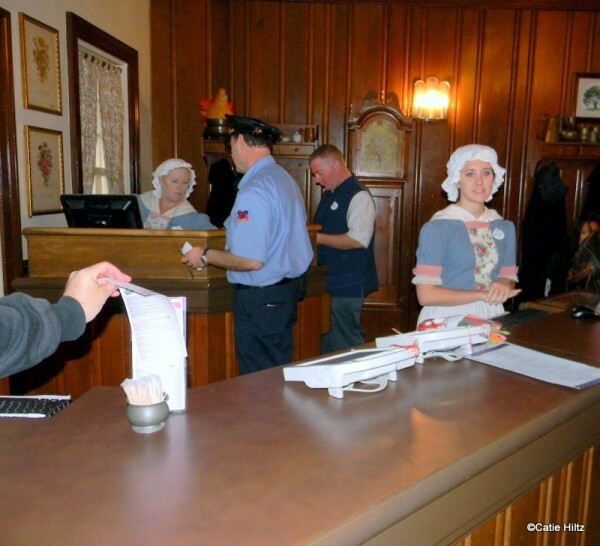 Be sure to check out all the details here from the seven rooms themed to figures from the United States of America’s history! And of course we had to check out the menu while waiting. The restaurant serves an a la carte lunch, but dinner is an “all you care to enjoy” family style meal, which means they serve you platters of food tableside. And best of all, you can have seconds (or thirds!) of anything and everything. The atmosphere in the waiting area was pretty loud and crowded, and there were people constantly streaming in and out, wanting to know if there were any open tables (there were not, so I was definitely grateful to have made my ADR’s in advance!). We were seated about 10 minutes after our ADR time, and led to the George Washington room – a quaint little room where it was much quieter and easier to carry on a conversation than in the waiting area. We were approached almost immediately upon being seated by our server, who inquired about allergies and took our drink order. He also scanned our Magic Bands (since we were on the Disney Dining Plan). Upon sitting down, we were handed a menu detailing the night’s feast. Dinner Menu — click image for larger version. The drinks are served in cute Liberty Tree Tavern mugs. 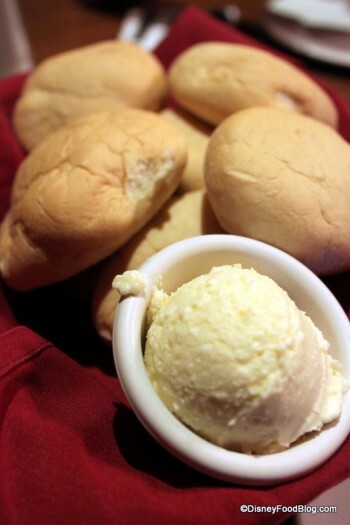 Bread and the Declaration Salad were brought out first – fresh warm rolls served with sweet honey butter, and the salad was cold and crisp. 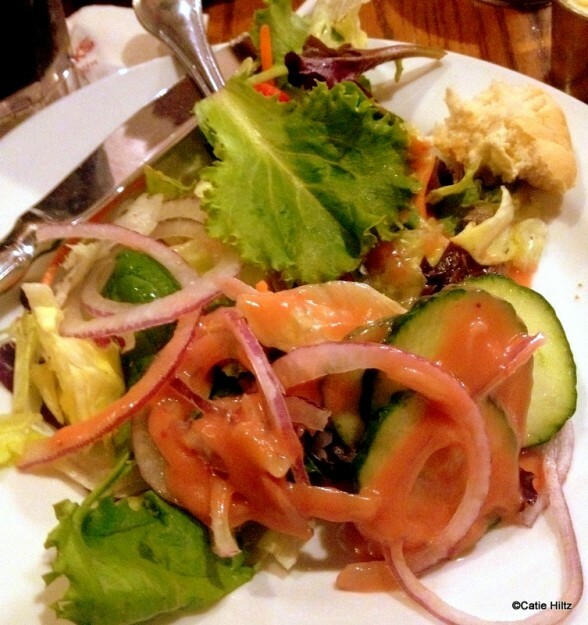 Normally the salad comes out already dressed, but we had two dressing choices on the side – the strawberry vinaigrette and a buttermilk ranch (as we have a strawberry allergy in the family) – and both dressings were very tasty. 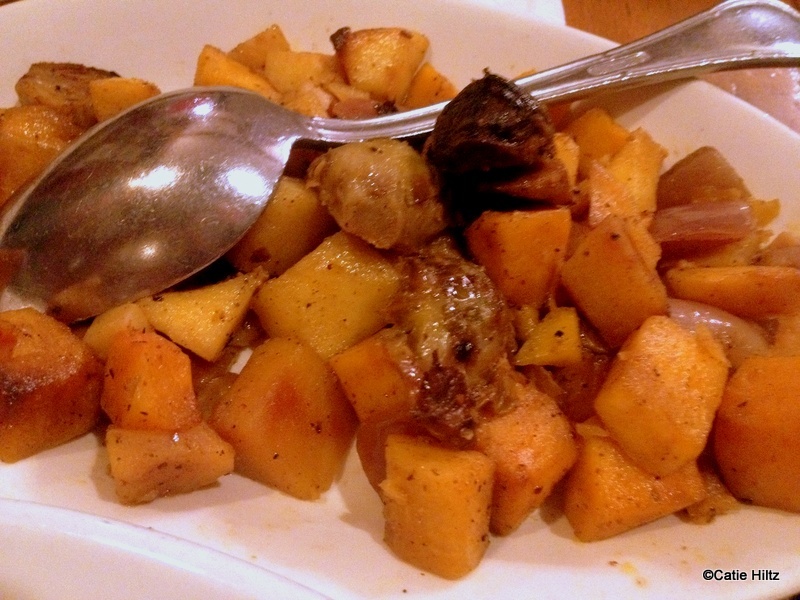 We had barely finished our salad before they started bringing out the main course – meats, potatoes, and more! 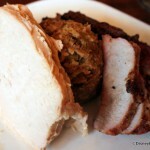 The entree includes Pork, Turkey, and Flank Steak. 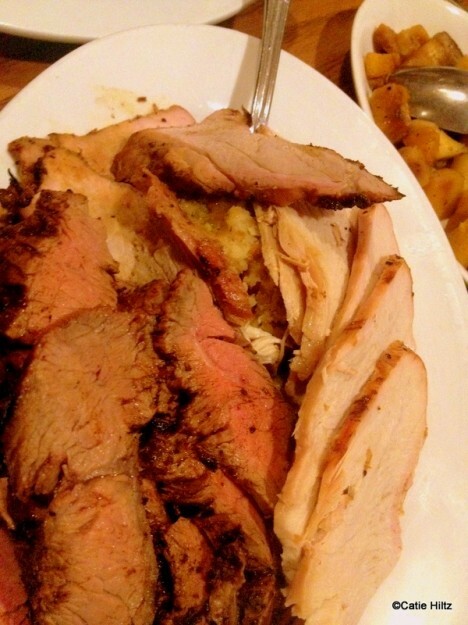 Pork, Turkey, and Flank Steak – with stuffing underneath! 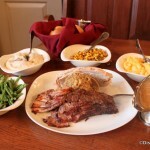 The meats were simply seasoned and moist, and the sides of perfect soft stuffing, creamy mac and cheese, crunchy green beans, roasted veggies, mashed potatoes, and gravy all went perfectly together. Now that’s a Christmas Eve feast! All the dishes were fresh, well prepared, and perfectly seasoned. We had seconds on the pork and green beans, but I have to say that to me – the gravy was the true winner at this dinner table – thick, nice and peppery, and paired perfectly with the turkey. 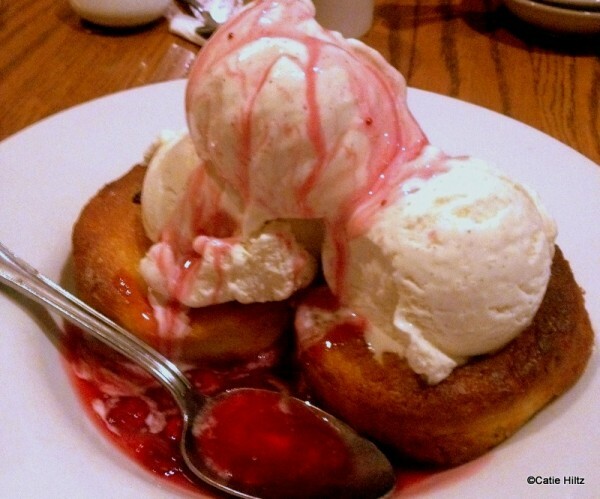 We didn’t have to wait long for our dessert to be brought out – apple craisin cake served warm, a la mode, and topped with a bright cranberry sauce. The Johnny Appleseed Cake was moist and paired well with the ice cream and sauce, which was just the right amount of sweet. Anyone save room for dessert? Once we were thoroughly stuffed, our check was brought out, and since we had already scanned our Magic Bands, all that was left to do was tip and sign and we were on our way! 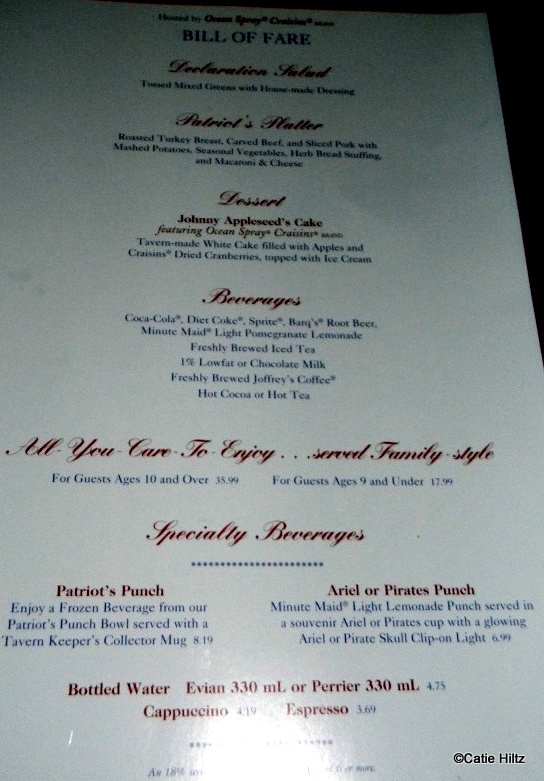 The meal during our visit was $35.99 for an adult dinner and $17.99 for a child ages 3-9 (or one Disney Dining Plan table service credit per person), and included all the food and a beverage of your choice (soft drinks, tea and coffee were available here). 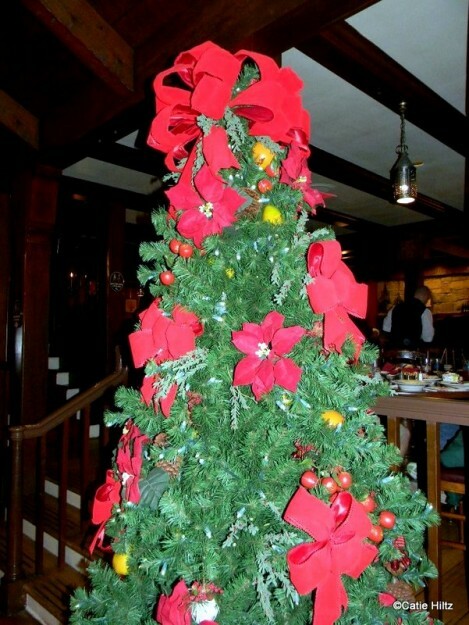 Overall, we really enjoyed eating Christmas Eve dinner at Liberty Tree Tavern. 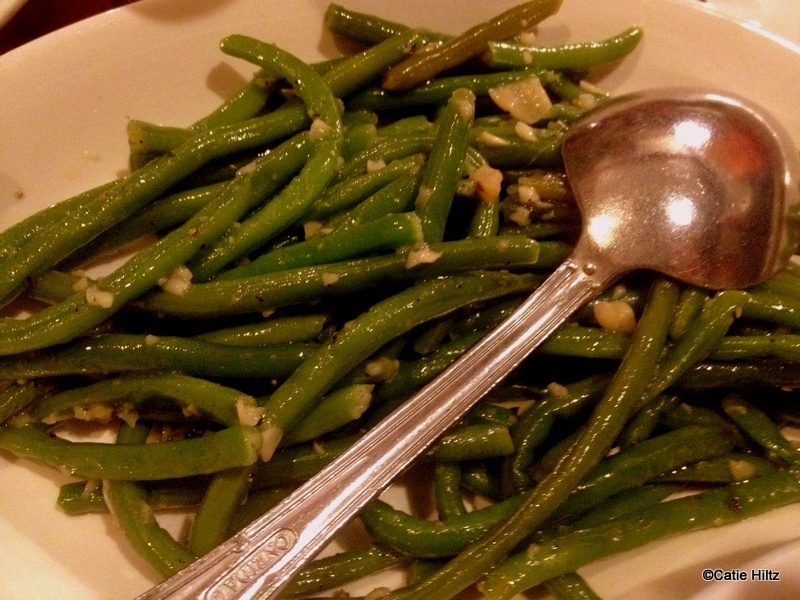 It’s certainly not an exotic or fancy meal, but it is delicious food that’s well prepared. 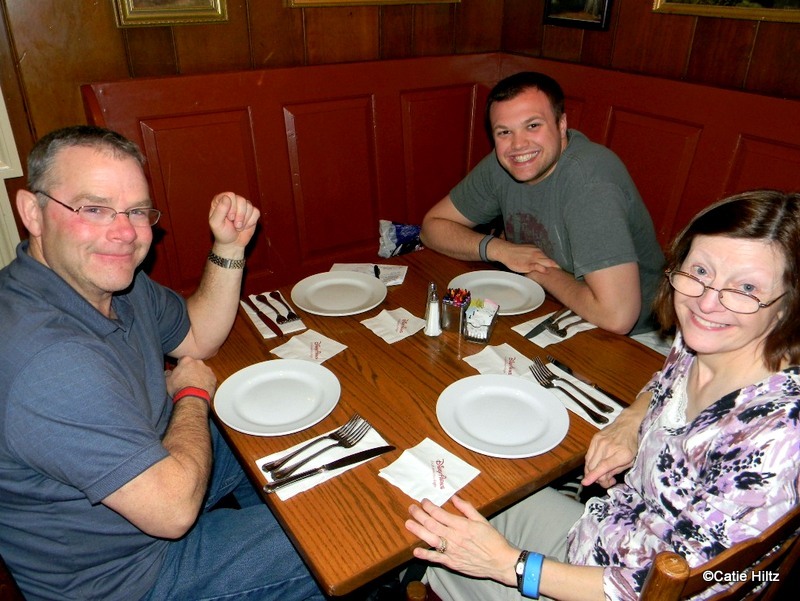 The atmosphere is kid and family friendly, so it’s worth a try for those who haven’t had the chance to eat here yet. 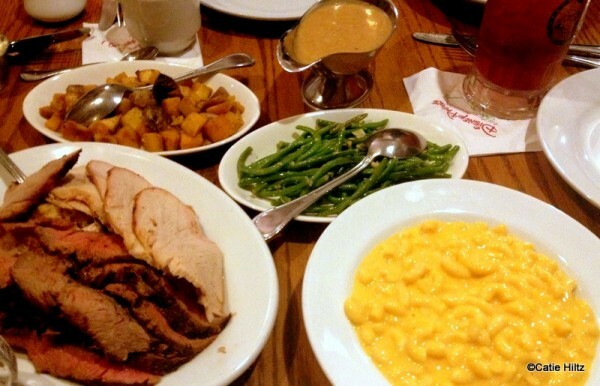 Personally, I know we will be back again for more of that turkey and gravy on our next trip! Catie Hiltz has been a Disney lover since age 4 when she was tall enough to ride Space Mountain and cried the whole time. Luckily, she got over that fear and loves visiting Disney as much as possible and writing about Walt Disney World at her blog, Living in a Grown Up World. Are the traditional fixings of Liberty Tree Tavern on your must-eat list? Let us know in the comments below! « News! Enjoy the Frozen Summer Fun Premium Package — Complete with Dessert Party! 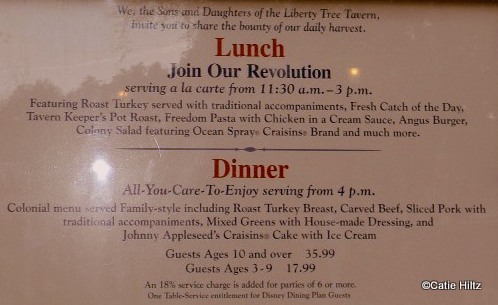 I do enjoy the Liberty Tree Tavern food, the only thing that let’s it down is the speed that the food is thrown at you. You feel like your on a conveyor belt and the main aim, is to get you fed and get you out as quick as possible. 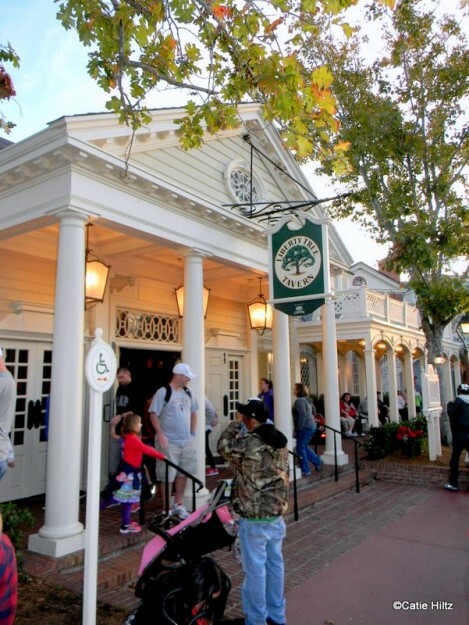 We love eating at Liberty Tree, but have been shying away from going there at dinner our last few times. As Zoe pointed out, they just keep bringing the food out while you’re still eating the last course, and you kind of feel like you have to shovel it in. And it’s a LOT of food to shovel in. We prefer going there at lunch, where the pace is more relaxed and the portion sizes are more reasonable. Zoe and Dana – I have to admit I do understand your pain – it did feel a *tad* rushed, but the restaurant was so busy that I think our waiter had a lot of tables, so it wasn’t as rushed as it could have been ha – but I have had your same experience here too. I will always go back probably though – can’t beat the atmosphere! 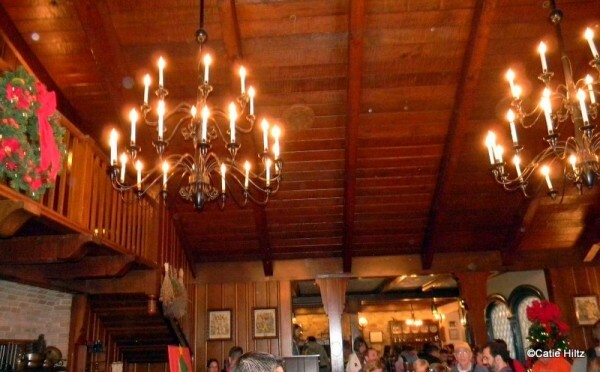 We ate dinner here in 2007 when it was still a character dinner and we had a very good time. The food was good; it wasn’t exotic or spectacular, but it was like a good home-y meal and it was all you could eat. The dessert was disappointing because I had hoped for the ooey, gooey toffee cake, but they were, at that time, serving fruit cobbler (which I usually like, but I mean, come on, how often can you get ooey, gooey toffee cake?!). So the food was fine and the characters were wonderful. They spent so much time with us, playing around and posing for photos and we didn’t even have kids with us. We really enjoyed that meal experience. Nice report! Thanks for completing this review. We were thinking of booking this for as eve dinner but was concerned that our kids may not like the food. They are very selective and tend only to stick with chicken fingers, fries, plain pasta or with tomato sauce. From what I can see in you pictures my kids may not eat much. I guess my question is, do they have other kid items on the menu? Thanks for the review. I had been curious if Liberty Tree did a special menu for holidays like Thanksgiving or Christmas, and your post illustrates well what it’s like to eat there at those times. (The regular menu applies, it seems.) 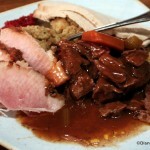 I gotta be honest though, it would not feel like Christmas dinner without a glass or two of wine to accompany my meal. I would probably opt for a meal at a signature restaurant, such as California Grill or Citricos, etc…instead. One of my favorite Disney memories occurred at Liberty Tree Tavern….this was back when it was a character meal! Mickey, Minnie & Goofy all dressed in colonial costume was lovely! After a fabulous dinner, walking out onto the porch & viewing the Main Street Electrical Parade = MAGICAL!!! 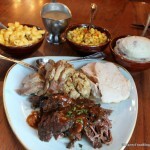 Anna – you are right – regular menu for the holiday. But the decor is amazing – so festive! 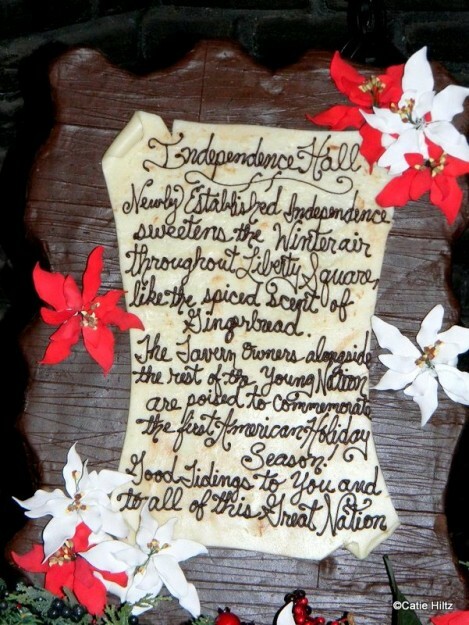 As for the wine and the signature meal that sounds like a great tradition too! I was there for Christmas with the family. My wife and I were there for Easter. I ‘m back for New Jersey Week. What happened to the rolls ?After the first bite my eyes light up with delight. Who would think a little sea salt on on an already good roll went to WOW!